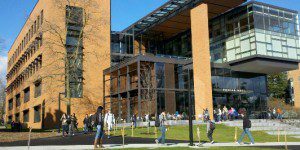 The University of Washington Executive MBA Program at Foster School of Business takes 21 months to complete. Two schedule options are available to compensate students’ professional lives and geographic placement. The North America classes meet once per month for three to four consecutive days (Wednesday through Saturday). Online academic sessions, as well as virtual study team meetings, support these meetings. The Regional Program meets once per week on alternating Fridays and Saturdays (occasionally consecutive Fridays and Saturdays), and offers weekly study team meetings and on-campus tutoring sessions. A total of 68 credits are required to complete the University of Washington Executive MBA program. The Foster adcom has set the sequence of courses, and students remain with their cohort for the duration of their academic career. Students in the EMBA do not take elective courses. First-year courses focus on disciplines including accounting, finance, and leadership, while second-year courses explore marketing, operations, and entrepreneurship. Furthermore, EMBA students start each academic year with a Residence Session, a week-long set of academic classes that helps students get immersed in their coursework, learn from guest speakers, and get to know their classmates. In addition, students are required to take part in an International Immersion, an eight to ten day trip that provides business instruction in locations such as Brazil, the Czech Republic, or Peru. Lastly, the capstone, the EMBA Business Plan Competition, encourages students to craft an original business plan for competition. The Foster Executive MBA class has 68 students, who joined with an average of 14 years of professional work experience, and 11 years of leadership experience. Students in the program are, on average, 38-years old. Roughly 34 percent of the class is female, while 35 percent were non-domestic students from 57 countries. About 10 percent are military veterans. Executive MBA students have access to a specialized career coach who helps students navigate job offers, develop new career paths, and handle workplace circumstances. The MBA Career Management offers students career coaching, online resources, advisory boards, networking events, a mentor program, and peer advisors for students in their second year. In addition, students can participate in mock interviews, resume reviews, and career advising. Total tuition and fees for the University of Washington Executive MBA is $108,000. This also coversmeals and lodging for residence sessions, and most expenses of the International Immersion trip. Financial aid may be available for some EMBA students. Active military and veterans may be eligible to have their full tuition covered by the Post 9/11 GI Bill. Students may also receive aid from Federal Stafford Direct Loans (up to $20,500), Federal Direct Graduate PLUS, or private MBA tuition loans. Students must submit an online application profile, transcripts, a personal statement, résumé, three recommendations (four for people who are self-employed), and a letter of endorsement. The GMAT is not required for EMBA applications if they have earned an accredited undergraduate degree, but applicants are welcome to submit scores that are less than five years old. Applicants may also attend an application workshop to help prepare their application. Once accepted, students are required to attend the EMBA Summer Workshop.